In January 1941, the USAAC issued a requirement for a new heavily-armed, high-performance interceptor fighter. The fighter was to be powered by the under developed 2300 hp Wright "Duplex Cyclone" twin-row radial engine. This was the heaviest engine to be mounted in a fighter, and was the same engine to power the B-29 bomber. Built-in armament was comprised no less than eight 20-mm cannon. Curtiss proposal was submitted to the Army in April 1941. In June, the Army ordered two prototypes under the designation XP-62. The USAAC placed an order for 100 P-62s in May 1942, but then cancelled that order in July. 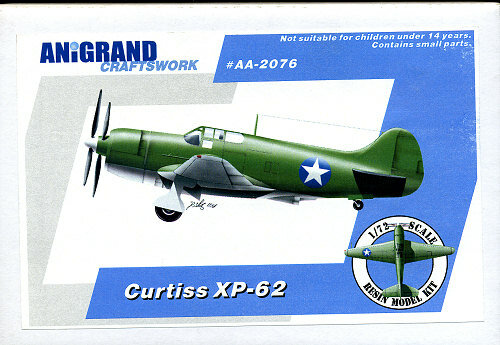 The cancellation was issued because the P-62 production would have interfered with the Curtiss licensed production of essential P-47 Thunderbolt. As it was, the Curtiss built Thunderbolts were never used in action and all went to training units in the US. Even though the Army really had no need for a high performance interceptor, the XP-62 project was continues. The XP-62 had its first flight in July 1943. Flight testing proceeded slowly due to the XP-62's low priority, and in the autumn of 1943 it was scrapped. This was yet another failure of a Curtiss designed aircraft and just added to the growing list of cancelled projects and designs (mostly due to the inability to meet specifications or poor workmanship) that was to plague the company until it went bankrupt several years later. Anigrand's kits are by now well known to readers of Modeling Madness. They provide a good basic model for the resin kit builder to expand their collections of prototypes and interesting aircraft. This adds to that. Though they are basic by design, there is more than enough room for those who want to add more detail to do so. Anigrand kits have also been steadily improving over the years. 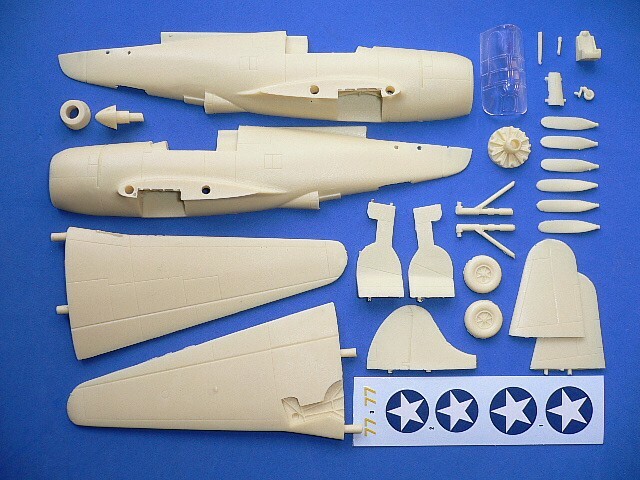 This particular kit has fewer molding faults than some in the past, though there are the usual air pockets that one will have to deal with. No large charge to those who have built these kits before and an excellent way for the beginning modeler to hone their skills before tackling some of the true horrors in the resin kit market! The parts layout shown has been swiped from the Anigrand web site so the bits there are all nice and clean. The stuff in the multi-section clear bag that comes with the kit are pretty close to what you see, but with all the remnant pour stubs attached. Some of the improvements that I've been pleased with seeing have been a change to a resin cockpit that one can actually mask, thanks to the somewhat prominent frame lines, and an improved instruction sheet. Though it doesn't show construction per se, it does offer a fine upper and lower quarter angle drawing that shows where all the parts should go. As usual, the cockpit and wheel wells (and probably the main wheels) are generic, but enough to give you something to work with. The decal sheet that comes with the kit is the same as with the XB-28, but all you really need are the insignia. In all, another fine subject from Anigrand. The kit is a great choice for the beginner and those who have some resin kits under their belts will find no surprises. These do make into super models so are kits that I can recommend to you. Make great gifts, too! Thanks to Anigrand USA/Nostalgic Plastic for the review kit. Get yours today and pay no shipping in the US or Canada.